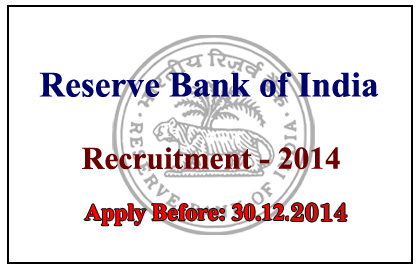 Reserve Bank of India has announced openings for the post of Pharmacists on ad hoc and hourly remuneration basis. Eligible Candidates can send their application before 30.12.2014. More details regarding this recruitment were mentioned below. Candidates should complete Diploma in Pharmacy in recognized board or university of North East States. Candidates will paid on hourly basis, Rs. 300/ per hour and 5 hours per day. Maximum Rs. 1500/day. Eligible candidates can apply for this post by filling the prescribed format of application given below and sending it to the below address given. Along with that application candidates should attach all their relevant certificates and photocopies. Envelop should be subscribed as “Application for the Post of Pharmacist on Ad hoc Basis”.